Even though I didn’t grow up eating it, I had been wanting to make meatloaf ever since I was re-introduced to it a few years back, probably at a comfort-food type establishment and probably with some nice gravy. I especially like that the dish looks and tastes like it sounds: meat + loaf. No mincing words there. Cook the bacon in a pan and then add the garlic, onion, and carr0ts, heating until the garlic and onions are slightly brown. Add that mixture to the ground beef in a large bowl, along with the beaten egg, bread crumbs, 1/2 cup of tomato sauce and fresh thyme. Add a little bit of salt and pepper as well, and then mix roughly (don’t pack the meat). 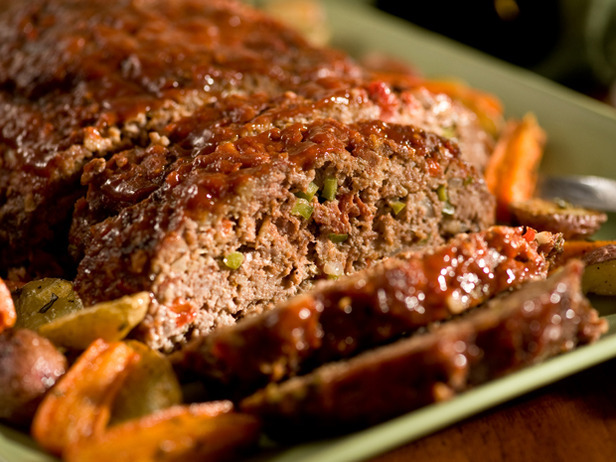 Transfer the meat mixture to the center of a baking pan and mold to your desire shape of meatloaf. Then, place into the oven and cook for about 1 to 1.25 hours; in the meantime, every 15 minutes, pour some of the glaze over the top of the mealoaf and baste the meatloaf with the pan juices. The meatloaf turned out quite tasty. I could have skipped adding any salt, as the bacon and the glaze already provided enough flavor. One thing I’ll have to improve on though, is getting the entire meatloaf to stay together better. Next time, I will experiment with adding a little more bread crumbs, perhaps an additional egg or half of an egg, and also adding a little milk. I also read that it’s best to let the meatloaf sit for about ten minutes after removing it from the oven, before slicing. I might experiment with making a nice gravy to accompany the meatloaf next time, as well. This entry was posted in American, Main Dish, Recipes and tagged Comfort Food, Meatloaf, Worcestershire Sauce. Bookmark the permalink.